The Ankara City Hospital complex hosts eight different hospitals specializing in different fields of medicine. The Ankara City Hospital, the latest addition to Turkey's drive to modernize its health sector, started admitting patients on Wednesday. The sprawling complex in the capital Ankara is the largest of its kind in Europe, said Health Minister Fahrettin Koca. 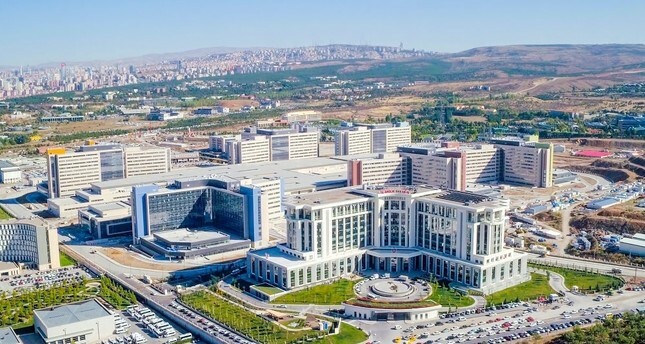 The hospital, whose official opening is expected to be made by President Recep Tayyip Erdoğan in the coming days, has 3,623 beds and employs a nearly 12,000 people, from doctors and nurses to technicians, midwives, et cetera. City hospitals are a new concept in Turkey's drive to improve its health care sector. They aim to improve health standards by significantly increasing hospital bed capacity and addressing the shortage of doctors. These large hospital complexes are mainly built in suburbs and house the staff and services of multiple existing hospitals in their immediate region. They provide services in a diverse range of medical specialties not available in other hospitals in many cities. To ensure the quality of services, the government has adopted a public-private partnership model for the construction and operation of the complexes. The city hospitals are being leased to private companies, and the government only pays fees for medical imaging, laboratories, security, maintenance and health care workers' salaries. Two more city hospitals are set to open this year in Ankara and in the northwestern city of Bursa. Speaking to reporters as he toured the hospital Wednesday, Minister Koca said the complex accommodated eight different hospitals specializing in different branches of medicine. "We want these complexes to be a health hub in their region," he said. Koca added that they wanted to cooperate more closely with universities for use of city hospitals. The minister underlined that the hospitals would be equipped and staffed enough so that "patients would not have to seek treatment abroad," common in the past, especially for patients with life-threatening diseases. The Ankara hospital is expected to have a daily admission of 30,000 patients. The hospital has 904 clinic rooms, an intensive care unit with 674 beds and 131 surgery rooms, where more than 600 surgeries can be performed daily. Between 2017 and 2018, eight city hospitals were opened in the cities of Mersin, Yozgat, Isparta, Adana, Kayseri, Elazığ, Eskişehir and Manisa and more are planned. When they are all built, they will have a total capacity of 44,409 beds. Construction of nine other city hospitals is underway across the country. Turkey has taken steps to rejuvenate its crumbling health care system in recent years. Hospitals run by the Health Ministry and Social Security Fund (SGK), formerly known as the Social Insurance Fund, were merged to prevent overcrowding in the latter. The government also reduced red tape in the treatment of patients with social security at teaching hospitals run by universities. Existing hospitals have also been modernized, and more than 500 new hospitals have opened all across Turkey. President Recep Tayyip Erdoğan, who previously served as the country's prime minister, pioneered the "city hospital" concept, calling it his "dream."